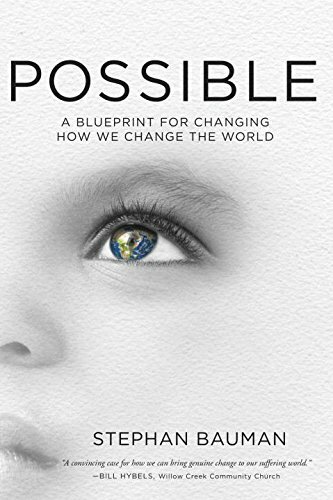 I asked to review Possible: A Blueprint for Changing How We Change the World by Stephen Bauman because making a difference must be about more than wearing rubber bracelets for a cause and sending checks. As the jacket description says, “We sense what needs to be done, but often we don’t know how to do it.” Exactly. I was looking for answers on how. Bauman seemed like a good guy to look to for these answers. He’s the president and CEO of World Relief, a nonprofit involved in disaster and emergency relief, humanitarian aid, and community/economic development. So I opened these pages with quite a bit of anticipation, excited to learn his story and see the vision he’s casting for the future. It’s an interesting story, and he casts a clear vision for next steps. When I finished the book, I was a bit disappointed. The “blueprint” chapters at the end seemed overly simplistic–gather the people you know, pool their connections and resources, make a plan to move forward (my cliff notes version). I was hoping for more. But as I thought about it later, I realized that this is really solid advice. Most people who have an innovative idea never make it anywhere near these three steps, which is why so few of us get something up and running to see if our ideas have merit. Yet these are foundational. You can’t build without them. Realizing this, I recommend this book. If you have an idea about “how” the world might be better, let Bauman inspire you to do this foundational work. This entry was posted in Books and tagged Possible, Stephen Bauman on February 20, 2015 by Trish Ryan.